These little cookies are made from a versitile, fool-proof, shortbread cookie recipe that you are sure to drool over. 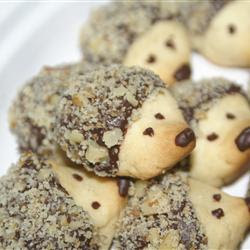 I then made them into a hedgehog by dipping them in melted chocolate and crushed walnuts on one side! In a mixing bowl, cream butter and sugar. Add egg and vanilla; mix well. Combine flour, baking powder and salt; add to creamed mixture and mix well. Form cookies (in an oval shape with a pointed end) and place 2" apart on on ungreased baking sheets. Bake at 375 degrees F for 6-8 minutes or until set but not brown. Cool on wire racks. Dip 3/4 of cookies in melted chocolate and then in crushed walnuts. Dot two eyes and a nose! CUUTE! They also look like mini hedgehogs! Perfect for my preschool classroom after we read The Mitten this winter!! How many cookies does one batch make and how big are they? How do you form the cookies if you don't have an "oval" shaped cookie cutter? I am dying to make these, BUT my grandson has a nut allergy. Is there anything else you would recommend that would look as good as the walnuts? Try Coconut! I think that would be a great substitute. Skor bits would be nice! Wow, those look adorably yummy! Saw a pic of them rolled in chocolate jimmys and it was just as cute. Brickle bits in the grocery where they have Nestle semi-sweet chocolate bits. Heath Bar and Skor make some. You can buy them whole and break them up. My sister has a hedgehog and knew I had to make these for her! I used 3/4 cup of butter instead of 1 cup and they tasted great to me. I shaped them by first rolling some dough into a ball and flattening it between both hands. I gradually shaped a point at one end. They sort of looked like rain drops until they were covered with the chocolate and walnuts. When it came to applying the chocolate I found that using a spatula to "paint" on the chocolate for the body was the easiest and allowed me not to have chocolate on the bottom. I used a spoon to sprinkle the crushed walnuts onto the body and placed them on a cookie sheet covered with tin foil for easy clean up. I used a toothpick to apply the chocolate for the eyes and nose. Afterwards I placed the cookie sheet into the fridge, allowing the chocolate to harden faster. I ended up with 18 cookies total. They are so cute! I can't wait to share them with my sister! I use rice crispies instead of walnuts. My son also has nut allergies, that's why we DIDN'T use skor bits because unfortunately, they're made from almonds. Every Christmas i make sweets and i give them as a gift to friends and family. this year i made those hedgehog.Everybody liked them!!!!! I had to make double dose and the dough was really soft and it spread during baking. I don't know if that should happened...But they where yummy! I also tried dark chocolate to dip.. I love this recipe:) I made these a few nights ago, and they were an absolute HIT! I made them with crushed walnuts which looked the best, but also white and brown sprinkles for those who didn't want nuts. Their little noses flattened down when they cooked, but that was really to be expected. My Dad said "Well now they aren't snooty hedgehogs". I also had to cook them about twice as long as you put in the recipe, which may have been because my hedgehogs were bigger. HI. I just made this recipe and sent the hedgehogs off to a party. They were so yummy! You did not tell me to flatten them so I didn't. They came out perfect and just the right number - about 1 1/2 cookie sheets. Next time I am going to make them bite size. I had to cook my larger cookies a lot longer than you suggested. The smaller size will be cuter. I'm a hedgehog breeder. My kids will LOVE this! How did you get the noses to stay up during baking? Oh my god I have tried three times to make these and they are always flat as a pancake. I'm so upset! If anyone has an adjusted recipe, please post it. It must be too much butter? More flour needed? They taste great though. So cute!! Will be sure to share this on my Hedgehog Website (hedgehogcare101.com)'s arts + crafts section! What is the purpose of the egg in this recipe? Does it keep the cookies from breaking? Traditionally shortbread wouldn't have egg, but perhaps it's needed because of the unique shape?